It’s commercial common knowledge that “people always want more distortions” and this is exactly what Ohmicide: Melohman is delivering. 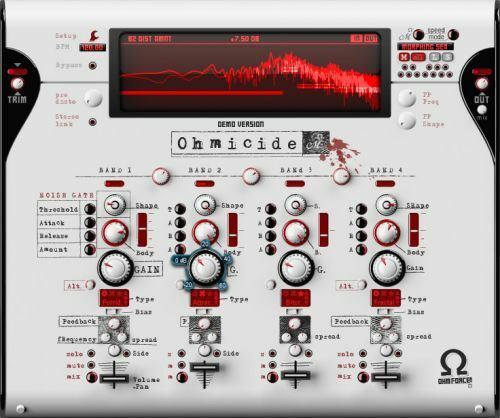 In one death blow.Based on Predatohm design, Ohmicide:Melohman is organized around up to four frequency bands, each of them coming with their own Noise Gate, Dynamics, Distortion, Feedback Generator and all mixing abilities with just a twist of pre- and post-processing (distortion input, high shelf output…). More than a simple delay endowed with a variety of features, OhmBoyz is almost an instrument in its own right. For sure, it’s an advanced stereo multitap delay, but it also has complex resonant filters, distortion high shelf and a total of 39 LFOs. Capable of combining several filter types, its unique approach is designed to yield amazing sounds quickly, even from the hands of beginner producers. Originally a Computer Music-exclusive product, it’s now featured for free in Ohm Force bundles, which alone makes these packages actual must-haves. Movement is the name of the game when it comes to the appropriately named Mobilohm. From the gentlest of caresses to immense, swirling waves of sound, this plug-in knows how to pump texture and depth into your compositions. Where Hematohm shatters harmonic content, Mobilohm enhances and transforms it. Having four separate cells allows for complex interplay between the different frequency ranges in your sound, and the different phase trickery you choose to apply to them. We see Predatohm as our cuddly plug-in. After all, if you want BIG, PHAT, WARM sounds from an intuitive interface, then this is your baby. Don’t get too comfortable, though, as this beast has claws, and its bark and its bite are both equally ferocious. Dial in one of the array of distortions to add an instant edge to your tune. Need a little more body? Tweak the compressor/limiter knobs to shape your sound to perfection. How about if you want to reign in the treble while blowing a hole through your bass woofer? Piece of cake, as Predatohm has not one, not two, but four frequency adjustable channels, each armed with all of the above features. Tired of mediocre melodies and bored by repetitive riffs? Sometimes you just need to get your sound dirty. Strap the Hematohm into your rack and marvel at the devastation it can reek on dull drums and soporific synths. Hematohm’s frequency shifting engine is everything you always hoped to get from a ring modulator but were too embarrassed to ask for. Not only can you radically manipulate the frequency content of your sounds, but the built in LFO and envelope follower will transform static parts into pulsating sonic behemoths.